The latest Sanity Squad podcast is now playing at Politics Central at Pajamas Media. We discuss the kidnapping and release of the Fox News correspondent and cameraman--both the psychological effects of such kidnappings and the phenomenon of forced conversion. My headset has been generating some weird audio effects, from low volume to hissing and popping and otherwise strange carryings-on. The very patient and kind audio guy at Pajamas did some troubleshooting yesterday, and has decided that the problem is one of microphone placement. So next time I think that my voice will sound more as it actually does in real life. Stay tuned. Oh, and the following has nothing to do with the podcast (at least I hope it doesn't! 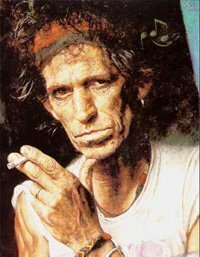 ), but it's a photo of Keith Richards I found at the PJ website. Be afraid, be very afraid. Who's afraid of the big bad UN?